Experience our gourmet collection of chocolate dipped fortune cookies. 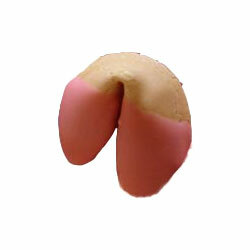 Our dark chocolate dipped fortune cookies will excite your every taste sensation while our strawberry white chocolate dipped fortune cookies are sure to delight. Our cookies are baked fresh, and dipped for each order, guaranting the highest quality. This item is SEASONAL. Personalize the cookies with your own custom message. All cookies are individually packaged in clear cellophane. Interested in further customizing your cookie's message with a photo or graphic? Contact us to learn more.